The concepts laid out in this document do not in any way relate to CellsV1, which includes the nova-cells service, and the [cells] section of the configuration file. For more information on the differences, see the main Cells page. An "API database" that is used primarily by nova-api and nova-scheduler (called API-level services below) to track location information about instances, as well as a temporary location for instances being built but not yet scheduled. 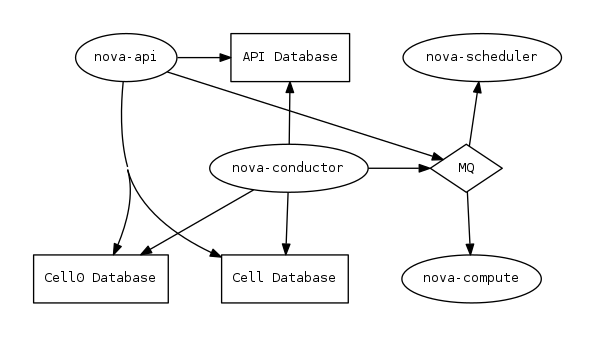 A "cell database" which is used by API, conductor and compute services, and which houses the majority of the information about instances. A "cell0 database" which is just like the cell database, but contains only instances that failed to be scheduled. All deployments have at least the above components. Small deployments likely have a single message queue that all services share, and a single database server which hosts the API database, a single cell database, as well as the required cell0 database. This is considered a "single-cell deployment" because it only has one "real" cell. 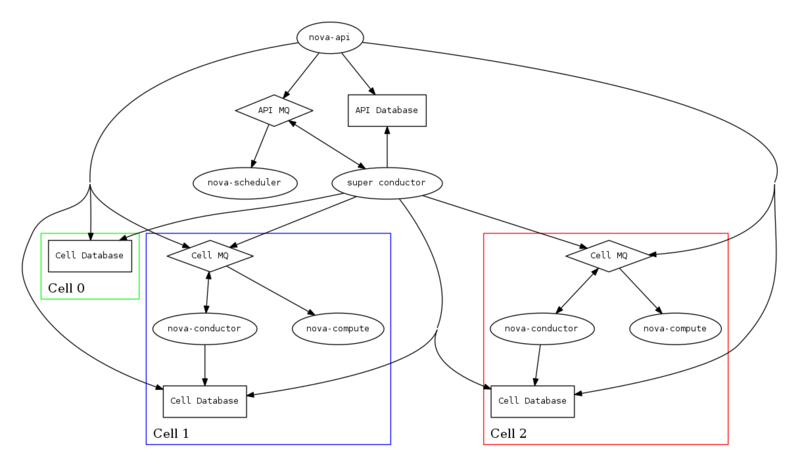 The cell0 database mimics a regular cell, but has no compute nodes and is used only as a place to put instances that fail to land on a real compute node (and thus a real cell). All of the services are configured to talk to each other over the same message bus, and there is only one cell database where live instance data resides. The cell0 database is present (and required) but as no compute nodes are connected to it, this is still a "single cell" deployment. It is important to note that services in the lower cell boxes do not have the ability to call back to the API-layer services via RPC, nor do they have access to the API database for global visibility of resources across the cloud. This is intentional and provides security and failure domain isolation benefits, but also has impacts on some things that would otherwise require this any-to-any communication style. Check the release notes for the version of Nova you are using for the most up-to-date information about any caveats that may be present due to this limitation. With a multi-cell environment with multiple message queues, it is likely that operators will want to configure a separate connection to a unified queue for notifications. This can be done in the configuration file of all nodes. See the oslo.messaging configuration documentation for more details. The Neutron metadata API proxy should be global across all cells, and thus be configured as an API-level service with access to the [api_database]/connection information. The consoleauth service should be global across all cells and thus be configured as an API-level service with access to the [api_database]/connection information. The various console proxies should also be global across all cells but they don't need access to the API database. Future work will deprecate the consoleauth service, store token authorizations in the cell databases, and require console proxies running per cell instead of globally. The second two are related. The summary is that some of the facilities that Nova has for ensuring that affinty/anti-affinity is preserved between instances does not function in Pike with a multi-cell layout. If you don't use affinity operations, then this will not affect you. To make sure you don't make futile attempts at the affinity check, you should set [workarounds]/disable_group_policy_check_upcall=True and [filter_scheduler]/track_instance_changes=False in nova.conf.